St Emilion proves a difficult appellation to generalize about in 2009. Clearly some truly great wines have been made here. Angélus, Cheval Blanc, Figeac and Belair Monange are absolute beauties. Many other properties have made forward and delicious wine but quite a few remain as thick, ponderous and extracted as they did early on. Maybe this is as it always is in St Emilion. There are obviously a great many different terroirs in this appellation. St Emilion is geologically and geographically very diverse. Winemaking approaches also span the spectrum from the marginally interventionist to the overtly so. Relatively warm, dry years can also prove a little tricky for Merlot, especially when grown on drier, sandy soils. This is partly why Pomerol normally eclipses St Emilion in such vintages with its [generally] more water retentive clay-based soils. Those properties in St Emilion that have more Cabernet Franc in the blends often out-perform those based exclusively on Merlot in such vintages, and 2009 was a year that produced exceptional Cabernet Franc in St Emilion, in just the same way as it favoured the Cabernets on the left bank. So much for the generalisations. The MW Institute’s tasting last November lined up twenty or so of the appellations finest wines, with Ausone, Clos Fourtet, Beauséjour-Duffau and Pavie perhaps the most obvious exceptions. Certainly the wines displayed a lot of tannin and extract early on in April 2010 during primeurs. For me this cast something of a question mark over the vintage’s true greatness here. Great wines had been made obviously, but many seemed undrinkably extracted and dry early on. Four years down the track, which look the most promising in the glass at this point? Château Cheval-Blanc was undoubtedly pick of the crop. This is fabulous Bordeaux, with forward, complex, come-hither aromatics and exceptional harmony on the palate. Close-neighbour Château Figeac continues to look extremely good too, though the sample was a more inky and reductive initially, suggesting the wine has gone into something of a slumber. Château Angélus has produced a very intense and concentrated wine. There’s such a lot of material here but it feels pretty tight currently. I’d put Château Canon in this category too. This is a very concentrated and serious effort which needs time. Château Trottevielle, is in a similar in style to these two if smaller in scale. This is a structured and intense effort that also appears to have shutdown somewhat. All the elements are there, it just needs a good five years to open up. Angélus and Canon on the other hand look to me like they need a decade or so to reach their best and both will surely prove very long-lived. Château Belair-Monange looks absolutely wonderful in 2009. There is terrific purity and freshness here and the wine stood out all the more for these virtues in a range of wines that frequently felt numbingly similar. 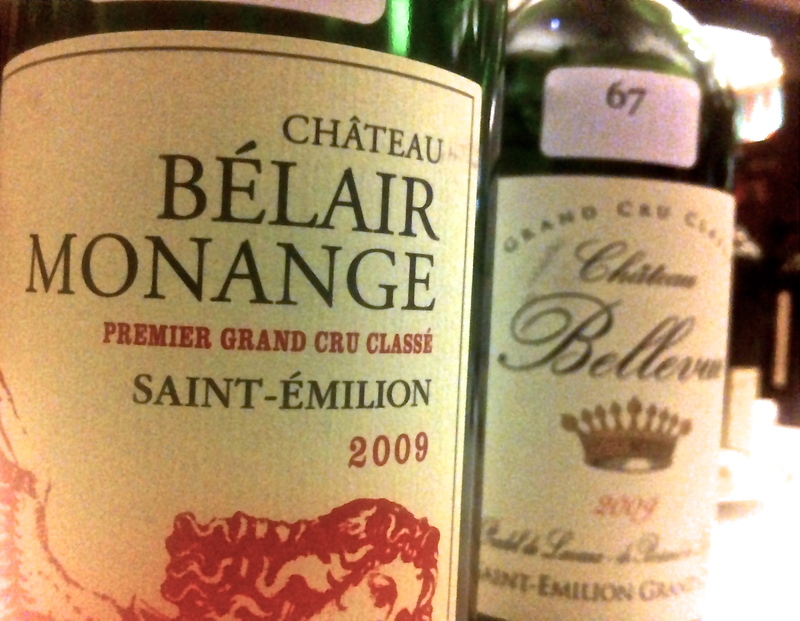 While Belair-Monange is already a beauty it has the freshness and balance to develop further. Château Canon-la-Gaffelière and Château Pavie-Macquin both look very good. These are both rich and ripe efforts, crowd-pleasingly so, but manage to retain a sense of balance. They are ready to drink now but will age further. Château Larcis Ducasse is in a similar vein – forward, unctuous and attractive. I’m not quite sure what to say about Château Troplong Mondot. This seemed to be managing the impossible on previous showings – an extremely ripe and heady cocktail weighing in at over fifteen degrees that somehow seemed to work. Troplong seems to have fallen of its trapeze on this showing. All I got was something thick, chewy with feet made of lead. I was not especially impressed with Château Balestard La Tonnelle, Château Beau-Séjour Bécot, Château Bellevue, Château Cap de Mourlin, Château Dassault and Château La Tour Figeac. This is not to say that these wines are faulty or incorrect, it’s just that they either lacked life, personality or freshness, and/or felt over-extracted and over-worked. Beau-Séjour-Bécot was a particularly surprising mis-fire as I recall it looking in good shape shortly after bottling. Those that managed to have freshness, ripeness and joy include Château La Dominique – a typically vivacious, fruit-packed effort – Château La Couspaude, Château Grand Corbin [very exciting] and Château Petit Faurie de Soutard. Like I said at the top, St Emilion in 2009 overall is something of a mixed bag. There’s plenty of fine wine here, but there plenty too that feel far too pushed. There’s also a lot of recipe winemaking in evidence. Nevertheless take a peek at the detailed notes below anyhow as, despite this, there’s still quite a range to the wines. All were tasted as part of the MW Institute’s Annual Claret tasting last November. Deep and saturated; some earth, prune notes; thick; thick and ripe again on the palate; lots of depth and extract; lots of fruit but feels a little chunky and extracted overall. Has shown better. Drink 2017-2030 88-90? Deep and saturated; very dark in the glass; thick and figgy; palate brighter than the nose suggests; ripe and thick with lots of structure; still feels very thick and very chewy. Now in no-man’s land a little. Was impressive at primeurs and after bottling but this sample feels overly thick and chewy. See how it goes, give it time. 2019-2035. 90-92?